What is the Newark Supergroup and why is it significant? The Newark Supergroup is a layer of Triassic period rocks located in the eastern United States; it is famous for its rocks and fossils from this period. The rock layers represent the remnants of several thousands of feet of sedimentary and volcanic rocks deposited in a chain of basins over a span of 45 million years. This layer is found in many locations, including New Jersey, Virginia, and North Carolina. The sedimentary strata contains a good cross-section of fossils from the Late Triassic period, including insects, fish, turtles, archosaurian reptiles (including dinosaurs, lizards, and snakes), lissamphibians (frogs, salamanders, and caecilians), and numerous plant fossils. Paleontologists hope to find additional vertebrate fossils in the Newark Supergroup layers that will shed more light on the evolutionary stages that led to groups of many organisms—especially the dinosaurs—during the Triassic period. The Newark Supergroup—indeed most of the area of the rift valley called the Atlantic Rifting Zone—is famous for reptile footprints, with tens of thousands of extremely well-preserved tracks from the Triassic and Jurassic periods. The tracks were first recognized in 1836 by U.S. paleontologist, the reverend Edward Hitchcock, a professor of natural theology and geology at Amherst College. He also described the Connecticut River Valley dinosaur footprints. These tracks are important because they show evidence of the evolution and eventual dominance of the dinosaurs. 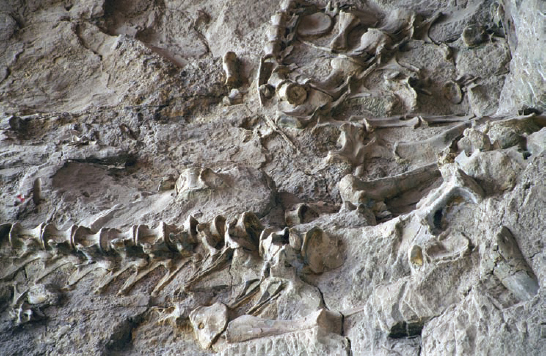 One of the richest fossil deposits from the Triassic period, the Newark Supergroup is located in the eastern United States (iStock).